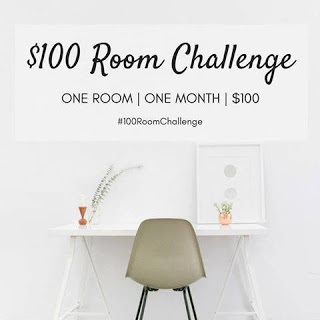 It's the 2nd week of the $100 Room Challenge and my mind can't settle on just one style for our half bathroom. 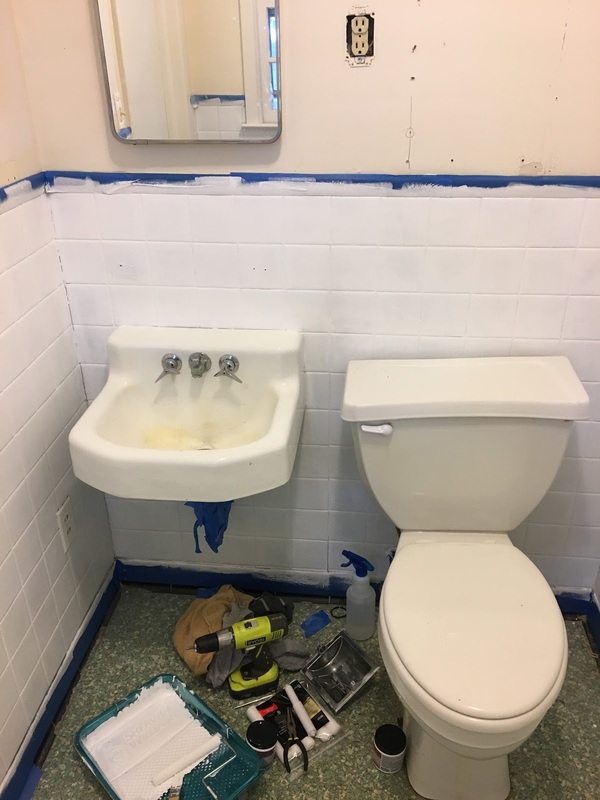 This week I only got to painting the tile since it was my birthday weekend (woot woot!). 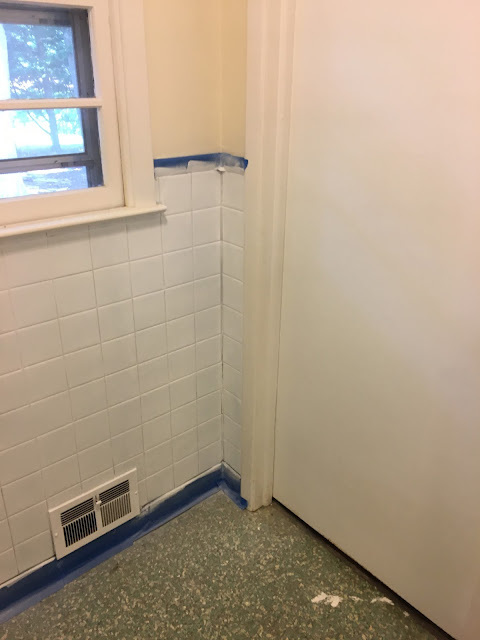 But painting the tile was a huge improvement. I also took the cheap-o storage thing above the toilet off the wall which made the room seem 10x's bigger. 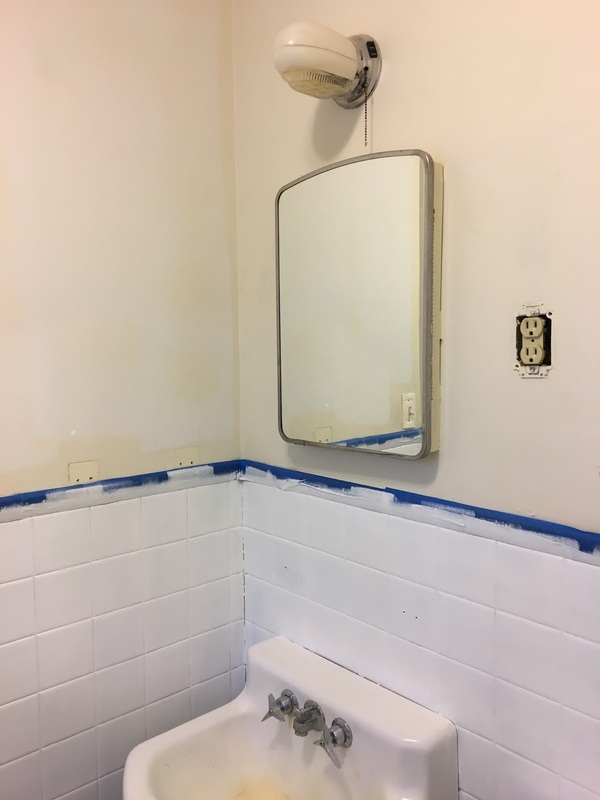 You can also catch up with the before pictures in Week 1. 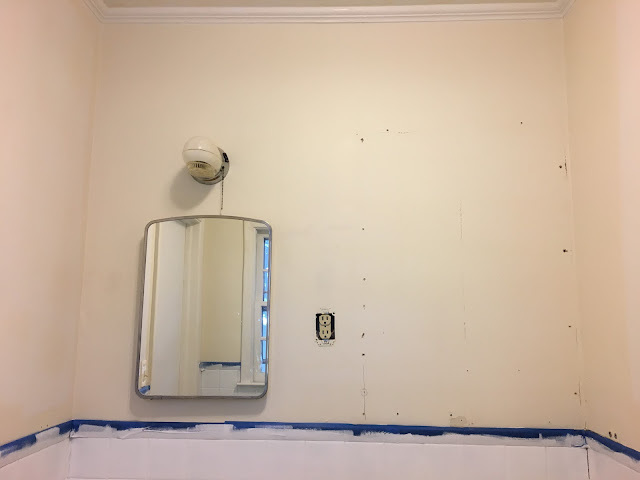 Our house was not built with the best specs, the studs are not spaced regularly and there are two fire breaks (boards that run horizontally) in the laundry room, so we're not really sure where all of the studs are in every room. That makes hanging the mirror and the shelves a challenge without putting a million holes in the wall, but we can save that for another week. I wanted to preserve the black 'tile' on the top border so I taped it off with some painters tape. We still need to paint the walls, so I left the tape on for these pictures. Now that it's painted, I need to caulk the corners and around the sink. I used the paint samples you can get from Home Depot, with no color in it, just the Matte/Flat Ultra Pure White base color that comes in the container. One container covered the entire space. 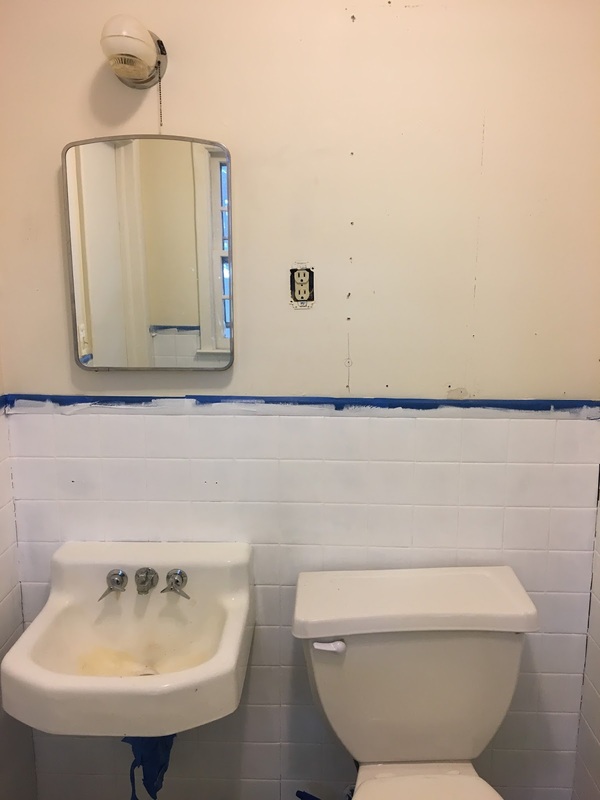 Once the first coat was on, I decided to go back and grab another sample to do a second coat, bringing my total to $6 to paint the tile. Look how much space was freed up with that cabinet gone! Originally I though we could salvage that piece, but when we used this bathroom I found we didn't actually use the storage space - so get rid of it we shall. My idea is to have two floating shelves in its place so we do have a little bit of storage, even if we don't use it that often. Another challenge is rewiring the sconce. If you watched my Instastories yesterday, you saw the sconce I got to replace the old one we currently have. But you can see the one we have up there now has a pull string, meaning that the electrical wire going to that light is always hot, it's not connected to a switch. So we'll have to run a new wire and hopefully a completely new light switch on the wall, we'll see if we can DIY that or have someone else do it. Make sure to check out all of the other blogger participating in this month's challenge below! The reveal week is only two weeks away and I'm so excited to see everyone's space. It looks better already, just having the cabinet gone and the tiles painted. It's going to be awesome when you're done! I love that you kept the black tile border. The open shelves will look great. Can't wait to see the rest!! Whoohoo for white tile! It is going to look so much better - can't wait to see it all finished!